High-speed trains seem like a great idea for cutting down on travel time, but there are two main problems with their operation. First, the trains run on an infrastructure model that hasn’t undergone any significant overhauls since the 19th century. More importantly, high-speed trains have to make frequent stops to take on and let off passengers, meaning that they can only travel at their top speeds for short amounts of time. 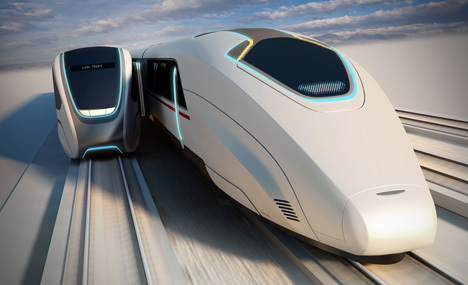 Industrial design group Priestmangoode have a radical proposal for a very different type of high-speed rail system. Rather than stopping at stations, the Moving Platforms train system would feature high-speed trains that never have to stop. When passengers embark and disembark, they would do so through the use of smaller local trains or trams that dock alongside the main train. Passengers walk from the main car into the transport car just like one would pass from one carriage of a train to the next. Once the car nears the next drop-off point, it simply un-docks. 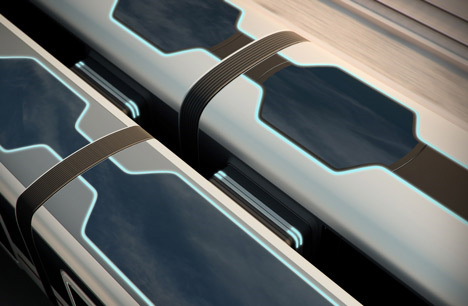 The docking trains act as mobile train stations and can even transfer passengers to other high-speed trains. Trams or local trains take passengers to their destinations, eliminating the need to drive personal cars to and from the train station. The system could make cross-country and international trips faster and much easier than the current system. 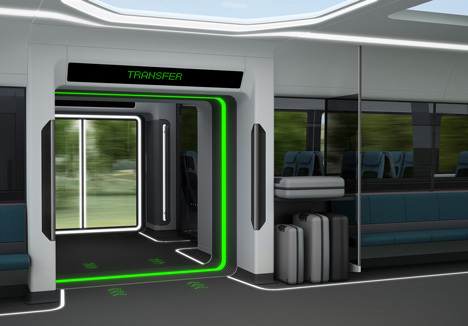 The designers at Priestmangoode realize that a setup like this would require vast overhauls of the entire rail transport system, an effort that would likely be too difficult and costly to undertake in reality. But their proposed system is the perfect jumping-off point for rethinking the way the worldwide rail system is structured and how it could change for the better in future generations. See more in Mass Transit or under Transportation. July, 2011.